I’m Misia. I’m a Skincare Coach, Nutritional and Holisitc Aesthetician and an advocate of happy and healthy ageing. Welcome to the first of a series of independant, honest and unpaid product reviews. For my first review, I decided to choose a product from my hometown, Nottingham. It seemed the right place to start – a local, artisan company rapidly gaining accolades and awards throughout the U.K. Supporting independants is important to me, because despite all the hurdles they have to jump and financial and commerical restictions they endure, their passion and determination is often felt within their product. Their skincare will be packed with love. I hope that you enjoy reading my review and that you feel some benefit when choosing skincare to nurture your skin. Nutrient-rich moisturising balm suitable for day and night wear. Suitable for all over the body. Sweet Almond Oil This hypo-allergenic nutrient-rich oil is safe for sensitive skin. Antioxidative properties help protect the skin, keeping it soft and supple. Shea Butter Rich in Vitamin A, a good quality butter can help with blemishes and wrinkles. It can also reduce inflammation and boost collagen production. It’s very hydrating and moisturising and provides immediate softness. This is a great ingredient for oily, problematic skins. Black Seed Oil With an astonishing array of healing benefits, this little-known oil has become the subject of many scientific studies. It is anti-inflammatory and antioxidant, protecting the skin in many ways. Particularly helpful for compromised skins (impaired barrier function). Frankincense Oil Known for its strengthening properties, Frankincense helps to improve skin tone and elasticity. It reduces the appearance of scars and acne and helps to heal compromised skins. Its fragrance is calming and grounding and can aid restful sleep as well as reduce feelings of anxiety. May Chang Essential Oil This beautifully uplifting oil immediately alters your mood. It’s a real tonic to the senses. Combined with the rich texture of Shea butter, you’re immediately taken on a luxurious and indulgent journey. This lemony scented extract is an antiseptic so helps with clearing blemishes and promotes healing. Vitamin E A natural antioxidant often derived from vegetable oils beneficial to the skin but also used as a natural preservative for organic skincare products. Gorgeous! Indulgent and mood enhancing. I fell in love with this lemony, intoxicating fragrance immediately. Every time you move, you get a gentle waft and if you use it on your hands and body, you just can’t help smelling yourself! No wonder Shona, creator of Skin Elixir, has created a perfume too! Creamy, pale yellow, balm. It’s quite rich and thick so if you’re used to using light, water-based fluids this will feel a little unusual. Particularly if you have blemished skin. But no fear, the oils selected are perfect for oily skins and will help to heal, restore and balance the skin’s natural sebum production. Start by using a tiny bit and warm between your fingers before pressing onto the skin to ensure even coverage and then massage it in. For those with dry and broken skin, you might like to start with a pea-sized amount. The more you use this balm, the better your judgement will become about how much you need. I liked the dark glass pot and old-fashioned screw lid. It feels handmade, which for me indicates passion and pride (because creating your own skincare isn’t easy to do!) The dark glass protects the contents from light degradation and is free from harmful toxic compounds found in plastic and, of course, is recyclable. I didn’t find it the easiest to use at first, but as I got to know the properties and behaviour of the balm, I was able to adapt my usage to my skin’s needs, the weather conditions and whether or not I was using makeup. On first application, I thought the product would be too ‘heavy’ for me, but as I used the product more often, my initial thoughts changed. It was adaptable, calming, soothing and very nourishing. It was my ‘go-to’ for walks in the wintry weather and for days when my skin needed a bit more TLC than my usual skincare gave me. I couldn’t help but think of what a beautiful healing, protective balm this would be for people with dry skins and skin conditions like eczema, psoriasis and dermatitis. I also used it on my hands and cuticles – what an amazing transformation! My hands looked young and healthy, and my dry cuticles were soft and invisible once more. I’ll definitely be using this to get my feet flip-flop ready for summer! If you have oily skin, you can use this balm as a cleanser as the almond oil’s properties can help to deep cleanse the pores without stripping the skin of its natural oils. Apply onto dry skin and massage well. Wipe off with a clean, warm cloth. Reapply a small amount of the balm as your moisturiser to protect your skin from drying out (and producing more sebum to compensate). Use a tiny amount around the eye or a specialist eye cream – perhaps Shona has one in the pipeline? Skin Elixir may be a little too rich for the eye area and may cause slight irritation for contact lens wearers. But if you find you’re OK with it, it’s a bonus. This is a beautiful, multi-usage moisturising product. I’ve tried a few ‘handmade’ and organic products in my time, but the choice of the oils in Skin Elixir are glaringly good quality. I’d suggest reducing the pot size or increasing the price tag! My pot is going to last me some time which means I won’t be returning to the store for a while…even though I want to! Great value for money. One of those products every household should have because you’ll always find a use for it, even if you don’t use it as your daily face cream. But I do recommend that you use it because over time, you’ll notice a happier, healthier and less lined skin. 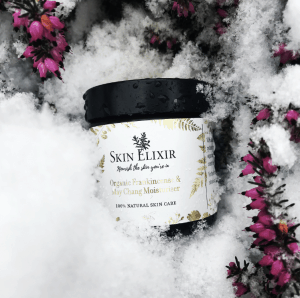 I’ve really enjoyed using Skin Elixir and it has quickly become a staple in my skincare regime. Editor’s Choice Winner Beauty Shortlist 2018 Awards. I have negotiated a 20% Discount for Soothe readers. Please enter soothe20 at checkout. Thanks to Skin Elixir!